The ability to get on with and learn from other children is hugely important for all children. Studies suggest that children with Down syndrome play with a playmate in ways expected for their cognitive level even though they have more delayed language. Further research is needed to explore how to compensate for language delays and promote age appropriate play. In most of the #education21 research summaries we have considered what adults may be able to do to support children's learning and development. In this last post in the series, we consider the early social relationships of children with Down syndrome with other children at home and at school. The ability to get on with and learn from other children is hugely important for all children and starts with children's play experiences. During play children learn to communicate effectively, to share, to cooperate and adapt to their partners. Play is considered to have an important role in developing children's social competence. [1,2] Children's social competence - the ability to manage one's own behavior, learn the social rules in different settings (e.g. in school, home, church, club, restaurant and shop), make and maintain friendships and co-operate with others in social and work situations - is, for all children, fundamental to their progress, happiness and quality of life. In a study of play contacts at home, they compared the play experiences of 27 children with Down syndrome aged between 4 years 6 months and 6 years 11 months with those of two same size groups of typically developing children - one group matched by mental age (therefore younger) and one group matched on chronological age. Despite being matched on a cognitive measure, it should be noted that the children with Down syndrome had more delayed language and more behavior difficulties than the mental age matched group. They found that the children with Down syndrome had fewer different playmates and the playmates were more likely to be younger than themselves, however, the frequency with which the children played with playmates in their mother's home was similar to the other two groups. Playmates were less likely to be classmates than for the other two groups and more likely to also have special needs. The average length of a play session for the children with Down syndrome was shorter than for the typically developing children of the same age but the same as for the younger mental age matched group. Mother's reports of the assistance they had to provide during play showed that there were no differences in levels of help needed from mothers of children with Down syndrome or MA matched children in getting play started, or remaining involved in play but the children with Down syndrome did need more assistance in understanding how to play. In terms of quality of play the older age matched children played more amicably than the children with Down syndrome or the younger mental age matched group. When looking at the level of involvement in play, the children with Down syndrome were less involved than the other two groups, with the oldest group showing the most involvement. When looking at which child was in control of play or if it was even, both children were rated as in control 43% of the time for the children with Down syndrome and 70% of the time in the other two groups. Overall while the children with Down syndrome were less likely to be in control of the play, they were sharing control in approaching half the session even though playing with children usually more advanced in cognition and language and even when not in control they may be learning from the interaction. When comparing the children with Down syndrome who were more often in control with those where more often their playmate was leading, the difference was not explained by either the language levels or behavior difficulties reported for the children or whether the playmate was a boy or girl or had special needs, therefore what enabled children to be in control needs further study. 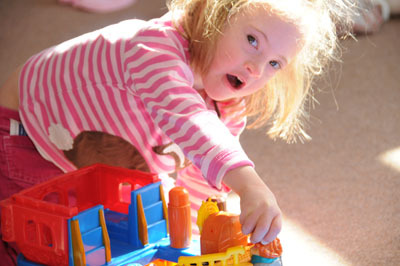 Overall, these findings are positive in terms of the amount and quality of play experience the young children with Down syndrome were having at home and many of the findings indicate that they are playing much like other children who are at the same developmental stage even with less expressive language. Guralnick and colleagues also looked at the same children's play networks in school rather than at home and teachers rated their play interactions. [ 4] They report that the peer social networks in school of the children with Down syndrome were again very similar to those of the younger children matched for mental age. They had similar numbers of friends and played with them the same amount, with similar levels of involvement in play, excitement and frequency of conflicts - even though only half the children with Down syndrome had an identified playmate who did not have special needs. Teachers reported that the children with Down syndrome needed more support for their play than the other two groups in terms of getting play started, remaining involved in play, understanding how to play and understanding the social rules. Differences in class size or teacher experience and whether the child was in a special class or inclusive class had no effects on the outcomes. As the children with Down syndrome were rated by their teachers as less prosocial, more hyperactive and distractible and showed more behavior difficulties, the authors conclude that the positive play interactions reported reflect the effectiveness of the support for play the teachers were providing during the school day though this was not directly evaluated. In a third study the same three groups of children were observed in play situations in a university research setting playing with same chronological age peers that were either new playmates not previously known or friends. As would be expected the typically developing chronological age matched children had the more advanced levels of play with new friends. On most play measures the children with Down syndrome and the group of younger mental age match children were playing in the same ways but the children with Down syndrome conversed less. This might also be expected as they had more delayed language. When the playmates were friends all the groups of children engaged in more group play and more constructive play, but familiarity did not influence amount of conversation. The researchers suggest that these results indicate that same age peers who will be developmentally more advanced are successful at supporting the play of children with Down syndrome. In the next part of the study, the children with Down syndrome were observed playing with new playmates matched on mental age therefore younger. Their play was not significantly different with the younger peers than with the older ones leading the researchers to suggest that the social orientation and representational play strengths of children with Down syndrome enables the younger less skillful playmates to still scaffold social play adequately. However, in a final comparison, pairs of typically developing children of the same mental age were compared with pairs of the same mental age with one typically developing child and one with Down syndrome. In this comparison, the children with Down syndrome and their playmates did engage in lower levels of group play and less conversation than when both playmates were typically developing. While these studies do report some differences, overall they suggest that the children with Down syndrome play with a playmate in ways expected for their cognitive level even though they have more delayed language and may have more difficulty managing their behavior at times. At this age, they are also having a similar amount of social play experience as other children. While these findings are very positive, if children with Down syndrome are to be fully included in preschool and school settings, they are in classrooms with same age and developmentally more advanced peers. Although the research suggests these children may well be able to support and scaffold the play of children with Down syndrome to play at their developmental level, this does not bring their play to the level of their age peers and language abilities may play an important role. These studies have not explored the effects of giving the peers coaching in ways they might better understand and play with the children with Down syndrome - for example, how to follow the child's lead and engage in play activities that the child with Down syndrome enjoys and is competent at so enabling reciprocal and successful play which can then be further developed. There are examples of successful training programs for children showing less competent play and communication skills for other reasons which could be implemented in preschool and school classrooms for children with Down syndrome. [1,6] For example, an intervention which was delivered successfully by training the children's teachers to target four communication skills during play, talk to your friend, listen then respond to what your friend says, use your friend's name to obtain his or her attention, take a turn and give your friend a turn. The intervention consisted of setting up specific play activities with the toys and materials on themes, (taking the dog to an animal doctor, visiting the doctor, going shopping) and scripts for each play theme were provided in story books. The books told a story which illustrated a play sequence, included models for language use, included theme vocabulary and emphasized specific social communication strategies. The book was read to a small group of children - not just the child needing the intervention - so peers were learning how to play more effectively and support one another as well. The play sessions were then observed and supported by teachers. In this study 9 of 10 children identified as needing intervention progressed on the play measures and the gains were still evident 9 weeks later. Time spent in solitary play decreased and time spent in social play increased. This matters as children who spend more time in solitary play are more at risk for behavior problems and social difficulties later. This intervention model with scripted play interventions, actively educating peers and delivered by the children's own teachers should be evaluated with children with Down syndrome. Improving the quantity of play and social experiences is important as well as the quality as social skills can only be learned and practiced in real social settings - this is a challenge which should always be front of mind for parents, teachers and those running social and leisure events in communities. Parents and educators are generally aware of the importance of play and of the benefits of play with non-disabled peers as role models. Smith, P.K. (2010) Children and play. Wiley. Newton, E. & Jenvey, V. (2011) Play and theory of mind: associations with social competence in young children. Early Child Development and Care, 181, 761-773. Guralnick, M.J., Connor, R.T. & Clark Johnson, L. (2009) Home-based peer social networks of young children with Down syndrome: a developmental perspective. American Journal on Intellectual and Developmental Disability, 114, 340-355. Guralnick, M.J., Connor, R.T. & Clark Johnson, L. (2011) The peer social networks of young children with Down syndrome in the classroom programs. Journal of Applied Research in Intellectual Disabilities, 24. 310-321. Guralnick, M.J., Connor, R.T. & Clark Johnson, L. (2011) Peer-related social competence of young children with Down syndrome. American Journal on Intellectual and Developmental Disability, 116, 48-64. Stanton-Chapman, T.L., Walker, V. & Jamison, K.R. (2014) Building social competence in preschool: the effects of a social skills intervention targeting children enrolled in Headstart. Journal of Early Childhood Teacher Education, 35, 185-200.